Gene Wizer’s father, Jim, established Wizer’s Market in Portland in 1929. Gene started working at the store when he was 7. The grocery store was moved to Lake Oswego in 1948, becoming the Town’s first supermarket. Gene took over operating the store when his father retired. He was the store’s longtime wine steward until 1989 when a new wine steward was hired to handle the growing market for fine wines. 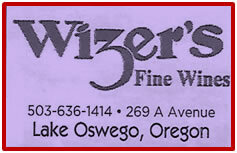 The grocery store closed in 2013 but the wine shop, Wizer’s Fine Wines, is still in business in Lake Oswego. Gene Wiser passed away in 2015.